THE ONLY other competitor that could challenge Pumpa The Wonder Horse in The Race That Slows Down The Nation is a mammoth. Pumpa, the Mackay Beach Races mascot will travel to Wedderburn outside of Melbourne for the November 2 "fake horse race" hosted by radio personalities Hamish Blake and Andy Lee. While a mammoth might sound like a breach of the rules, Pumpa's "trainer, strapper and farrier" Mick Pope said a mammoth was actually an ancient horse. 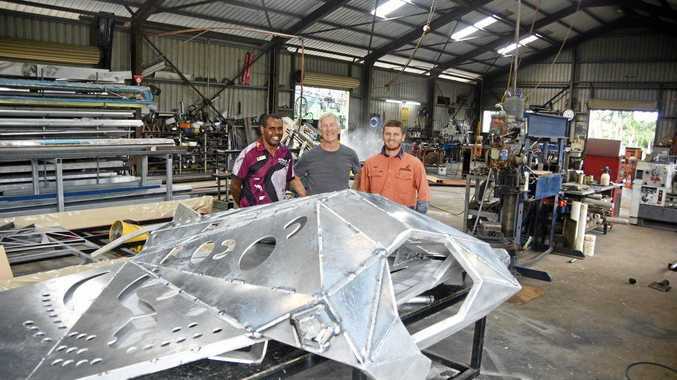 "If it falls on Pumpa that could cause some problems," Mr Pope said. "But nothing else will faze him. He's confident." Jake Evangelou plans to wear his Adidas running shoes and 12-pound boxing gloves inside the Pumpa the Wonder Horse suit for The Race That Slows The Nation. 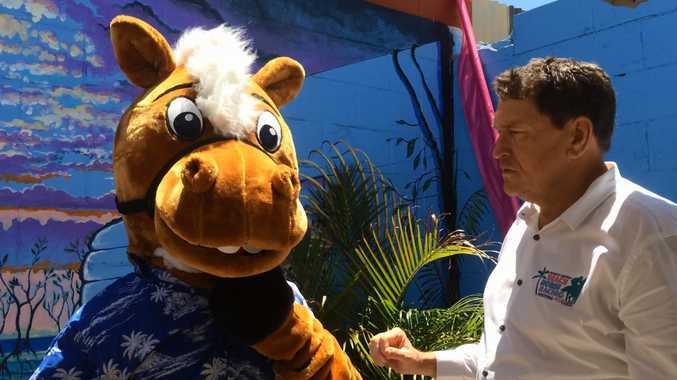 But he also has a four-day-a-week training program, just to make dead sure the Mackay Beach Races mascot comes out on top during the November 2 race, organized by radio personalities Hamish Blake and Andy Lee. "I am in fantastic shape," Jake said. "I haven't taken any advanced supplements but my physical condition is 1000%." His training program starts off by running on a treadmill for 30 seconds on level 15, before a 10 second break. "I repeat this for four intervals, and then I boost the level up to 17," he said. "Then for my endurance, I run up the Kangaroo Point stairs 10 times, twice. So 20 times." But although "Pumpa Jake", as he now like to be called, will be unshakable physically, he's also prepared race-day tactics. He'll wear Adidas running shoes and 12-pound boxing gloves underneath the suit, to knock wayward competition out of the way. "I'm not going to back down from a bit of push and shove," he said. "They're going to light a fire cracker on my back beforehand and that will set me off to a good start. "If I fall over, I'll be up as quickly as I came down." It will be Jake's first time in Melbourne, but he's confident he'll acclimatize quickly to the southern conditions. "If it's hot, that will work well for me," he said. "If it's not hot, even better."